The International Meeting of Styles (MOS) brings aerosol artists and the public together to experience live aerosol art and the creative process. It provides a focal point for urban street culture and a platform for aerosol art to reach the larger community. It is an event inspired by creativity and cultural exchange. The original MOS originates from Germany and has a worldwide reputation and respect because of its message and authentic style. Since it’s inception it now features in 17 cities around the world. 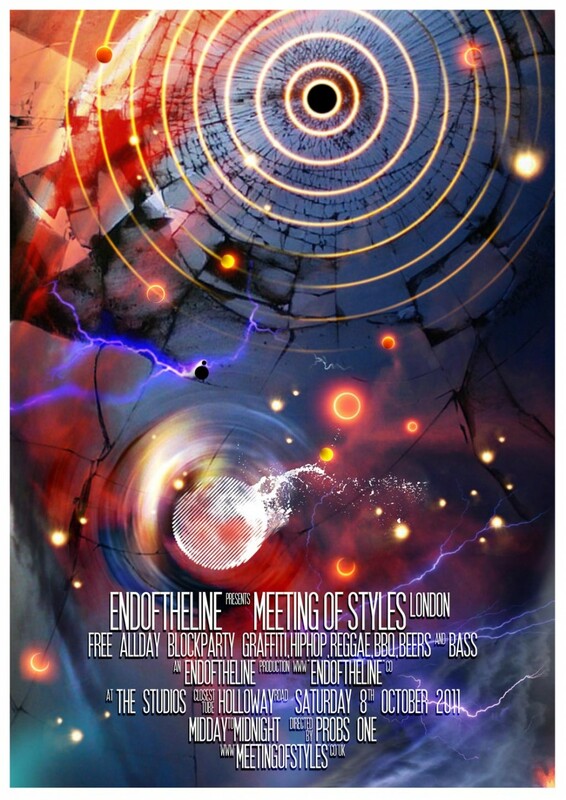 In October 2011 End of the Line presents the British edition of Meeting of Styles with its 4th event in London. This annual event has grown from 15 artists and one main wall in its first year to a full scale outdoor block party and street exhibition of 60 artists in 2010. This years meeting, which has a great line up, will be held on October 8th at The Studios, Hornsey Street, Islington, N7 8GR.